Grace Hamilton and Noah Duffy enjoying the hot weather. IF you thought the two-week heatwave was nearing an end, think again – temperatures are set to hit 28C this weekend. With mercury levels in their low 20s today, sun-worshippers are advised not to cancel their barbecues or trips to the beach just yet. 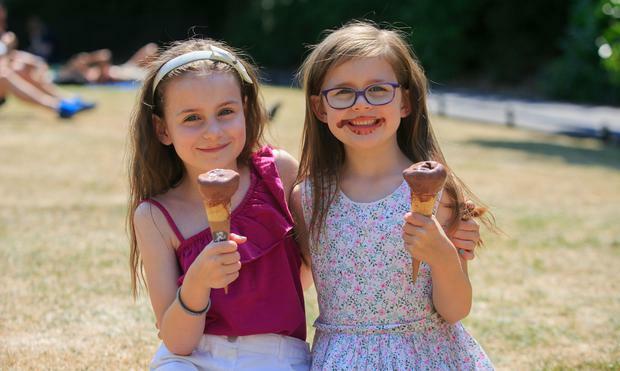 According to Met Eireann, temperatures on Saturday and Sunday are expected to match those of last weekend, when Dublin basked in glorious sunshine. “This weekend will be very sunny, with temperatures in western areas reaching to 24 to 25C,” a Met Eireann spokesperson said. With the capital experiencing its driest June in nearly 80 years, the scorching weather may continue into next week. “We should see similar warm and dry conditions run into next week as the high pressure affecting us at the moment is expected to last for a bit longer,” the forecaster added. According to Met Eireann’s monthly data report, rainfall for the Phoenix Park last month was measured at a mere 3.8mm – the lowest June figure since 1941. Most of Ireland is not experiencing "absolute drought", which is defined as 15 or more days in a row with less than 0.2mm of rain. Today will be somewhat cloudier compared with previous days, with a few spots of drizzle and light rain affecting parts of the west and northwest in the morning. It will be cooler in the west and north, with top temperatures of 17C to 22C, but warm again over much of Leinster and Munster. Tomorrow will be mainly dry, with maximum temperatures spanning the low 20s and warmer conditions in the midlands. Meanwhile, a nationwide ban on hosepipes will come into effect tomorrow. The ban was first introduced in the Greater Dublin Area on Monday. The move now means the whole island faces water restrictions after Northern Ireland Water enforced a limit on domestic water use on Monday.